Completed in September, 2003 after 3 months work. Concrete hand built over a metal armature up the steep slope of my sculpture garden. 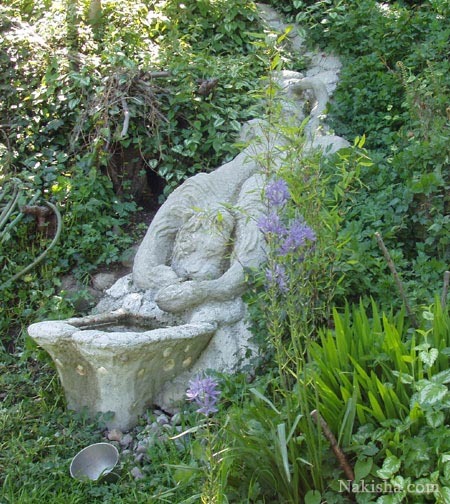 The water runoff from the gutters of the house runs through three rain barrels, then down the hill on the hand built rocks, over the lion's back, and eventually trickles through his mane and off his upturned, extended paw. I was inspired to expand on the classical garden feature of a lion, but I wanted to do something different than the openmouthed, "spitting" water type lions/ gargoyles/ rain spouts which I always found somewhat disturbing. The idea of a large, sleepy animal withwater running down it's back and being caught in it's paws was appealing, and this is the result.